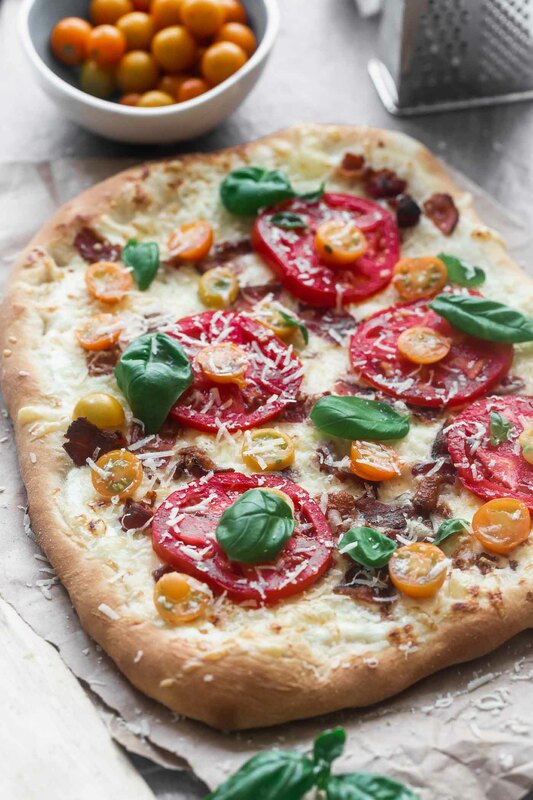 Ricotta, Bacon and Tomato Pizza. Ahhh swoon. This is the kind of pizza that comes to mind when I close my eyes and daydream about the perfect summer pizza. A crispy, chewy crust (thanks to this New York Time’s recipe). A light, creamy sauce – no traditional pizza sauce here! And fresh-from-the-garden tomatoes that are as sweet as candy. Fresh basil from the garden is an extra added bonus. Oh! And there’s bacon. I mean, do I need to convince you to try this? Homemade: Is it worth it? I will not lie to you though, if you’re looking for a slap-it-together kind of pie, this is not your best bet. There are several steps which include: making from-scratch pizza dough, making ricotta from scratch, and cooking bacon. Nothing is difficult, it just takes a little bit of time, and that’s okay with me. You COULD use store-bought pizza dough and you COULD buy ricotta, but I tried it with store-bought ricotta first and it was just not as good. I find that store-bought ricotta is innantely sweet, and it’s hard to tie it into a savory dish. If you have somewhere you can buy truly fresh ricotta, then go for it, but it’s super easy and inexpensive to make it at home, so why not?! When I say this pizza is delicious, I mean it. The simplicity of the three cheeses – ricotta, mozzarella, and parmesan – paired with salty bacon is out of this world on its own. 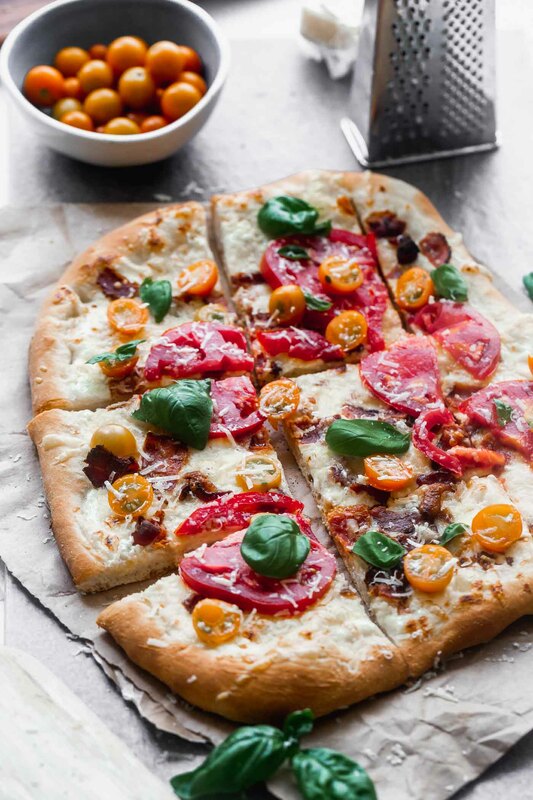 But covering it in super ripe heirloom and cherry tomatoes really takes it over the edge and gives it this amazingly light and airy feel that’s so refreshing to see in a pizza. 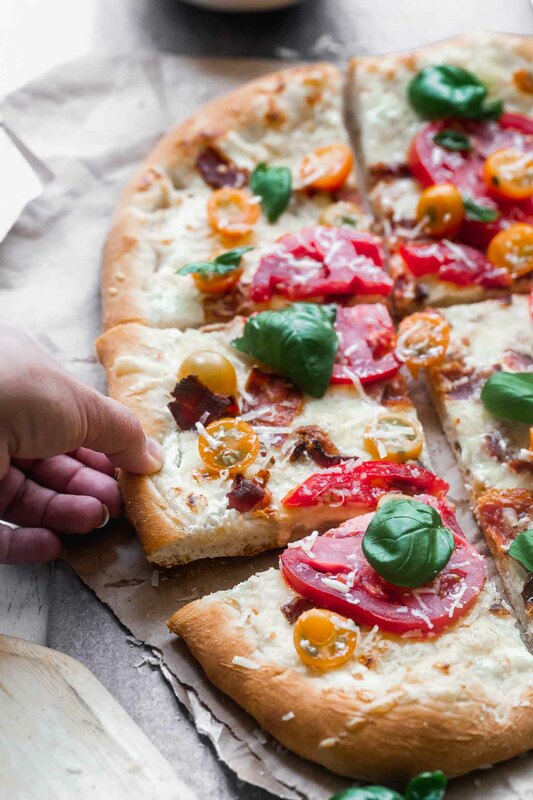 Ricotta, Bacon and Tomato Pizza: The perfect crust. So when it comes to pizza, I’ll pretty much take it any way I can get. Give me all the sauce options and toppings. But when it comes to crust? Well, I’m kind of particular. While I’ll definitely get down on a pan, hand-tossed, or super thin crust, my absolute favorite is a Neapolitan-style crust. For me, it’s the perfect combination of thick and thin, and I adore how crispy it gets on the outside and edges, but how soft and chewy it is on the inside. Surprisingly, it’s not just the composition of the ingredients and recipe that make a Neapolitan pizza, it’s the method in which you cook it. After much trial and error, I found that the most consistent way to cook it is in a screaming hot oven (550 degrees or however high your oven will go), a pizza stone (love this one !) that’s pre-heated for at least 30 minutes, and watchful eye. I’ve also heard good things about this pizza steel to cook it on, but have yet to try it myself. If you want a more detailed explanation of how to cook the perfect pizza, I talked about it endlessly here. Pizza dough is made, while it rises, make the ricotta. While the ricotta drains and the dough rises, shred the cheese and preheat the oven and pizza stone. 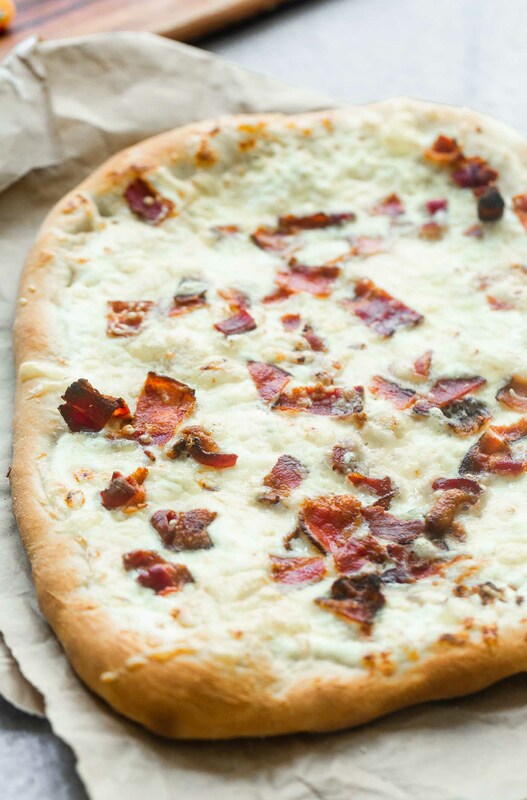 As the pizza stone heats, cook the bacon in the hot oven, but watch it, because it cooks FAST. 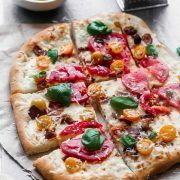 While the bacon cooks and the stone heat, roll out the dough on a pizza peel (love this one ! ), slather with ricotta, cover in mozzarella and sprinkle with parmesan. When the bacon finishes cooking, roughly chop it and sprinkle on top of the pie. Slide the pizza on to the pizza stone, and while it cooks, slices the tomatoes. After the pizza comes out, cover with sliced tomatoes, basil, an extra bit of parmesan cheese and a generous amount of salt and pepper. Also, a little bit of good-quality olive oil wouldn’t hurt. Preheat oven to 550 degrees. Place a pizza stone in the oven. The pizza stone needs to heat for 30 minutes. While the stone heats up, cook the bacon in the oven on a rimmed baking sheet until crisp. Make sure to bake on the middle rack so it doesn't burn. Watch it carefully, it will cook fast at this high of a temperature. While the bacon cooks and stone heats, make the ricotta. Link a sieve with cheese cloth. If you don't have cheese cloth, you can line the sieve or strainer with paper towels. Add milk, cream and salt to a medium saucepan. Bring to a boil. Add lemon juice and stir until milk curdles. Cook for another 1-2 minutes while stirring. One the mixture is completely curdled, gently pour into the sieve. Let the ricotta drain for a few minutes until all liquid is gone. Transfer ricotta to a food processor. Add garlic clove. Pulse until whipped and garlic is combined with the ricotta. Add nutmeg, pulse one more time. Season to taste with salt and pepper. Roll pizza dough out to a circle or rectangle on a pizza wheel covered in cornmeal or heavily floured. After rolling out, make sure dough isn't sticking and can easily slide off. Spread ricotta on dough. Sprinkle with mozzarella, followed by parmesan. Sprinkle with bacon. Slide pizza off of wheel and on to pizza stone. Bake until pizza crust is crispy and cheese is bubbly and starting to brown, about 10 minutes. Once the pizza comes out of the oven, cover with tomatoes, cherry tomatoes and basil. Sprinkle with salt and pepper. Garnish with parmesan cheese.